Check out some of our giant events! 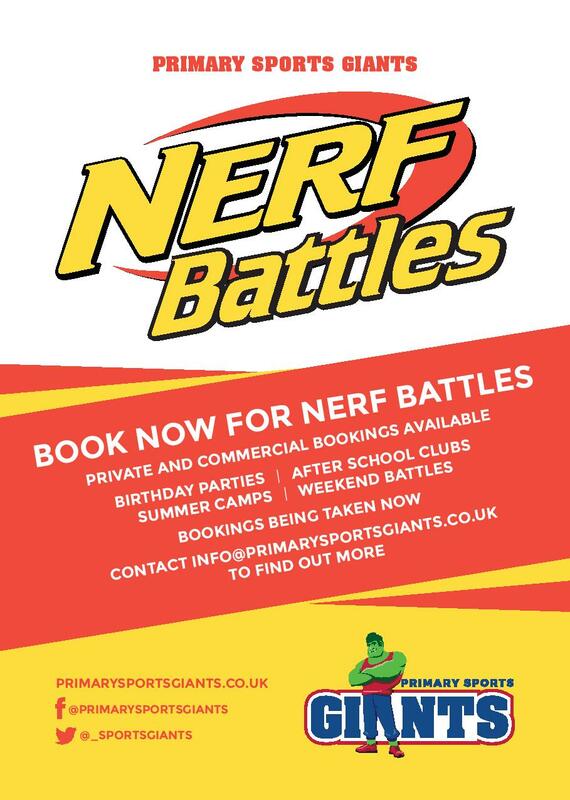 Why not give your children’s birthday party a boost with our fun and interactive Nerf Battles experience! With a range of games and variety of equipment to use our coaches will plan a high energy experience that your child will remember for years to come. Thinking about this for adults…? Our Nerf Battles events can also be designed for adults in mind and would make a great addition to any celebratory or work event. Have a child under 6? We can also offer a BMX Balance Bike party with the use of our brand new Strider bikes! Get your little one’s pulse racing with timed trials, races against their friends and obstacle courses in this fun packed party package. Contact Tom and Fran for more details at info@primarysportsgiants.co.uk. Fun packed event for children & adults to experience together. From hiding behind giant inflatable bunkers to using over 40 Dart Tag Guns. All players will love the fast based high intensity Dart Tag Battle games. Players will develop their team work and be able to try out leading a team to victory! Parents are welcome to leave children with our qualified PE teachers and coaches. Children can bring their own Nerf guns, but please label them. A fantastic Balance bike circuit with obstacles and races for children under 6!!! Children can bring their own bikes (helmets are mandatory) or they can try out some of our brand new Strider race bikes. Riders will take on BMX obstacles and race others around our race circuit. Prices will be given out at each event. Please visit HERE to see it in action or email info@primarysportsgiants.co.uk to book private birthday party sessions.